#1 Identify road conditions you will be travelling on. Sealed well maintained highways are not always laid in front of you. Over 60% of Australia is only accessible by off-road set up vehicles. Keep in mind what weather conditions can effect the road conditions you will be travelling on. Consider what other traffic will be using these roads, for example - road trains and wide loads are more frequent out west and you may have to pull off the road a lot more. 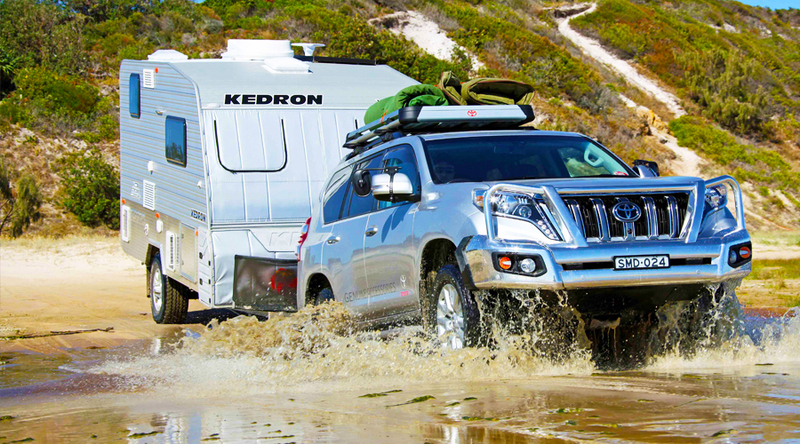 If your caravan, boat or trailer GTM exceeds 750 kg, legally you must have brakes fitted. Electric brakes are preferable to mechanical as you can apply electric brakes independently if you need to. This is very important if your caravan is swaying whilst driving at speed. Let’s say your caravan happens to be swaying behind you at speed, you then apply the brakes to your ‘caravan only’, the electric brakes will pull your vehicle rear end straight again by rapidly slowing down or ‘braking’ your caravan only reducing excessive swaying. If you operate both vehicle brakes and caravan, boat or trailer brakes at the same time whilst swaying, there is a potential of worsening the swaying already occurring which can be disastrous. Mechanical activated brakes on your caravan boat or trailer are better than no brakes at all, but independent electric activated brakes are better for the control of your vehicle and the safety of your occupants. A weight distribution system installed at your vehicles hitch point can raise your rear end and help level out your whole set up for greater control and performance by spreading the load from your hitch point to your whole chassis (both vehicle and caravan). Generally used when your tow vehicle still sags at the rear even when your setup is correct and within the recommended specifications. A sagging rear end will reduce your brake and steering efficiency on the front end as it becomes lighter. 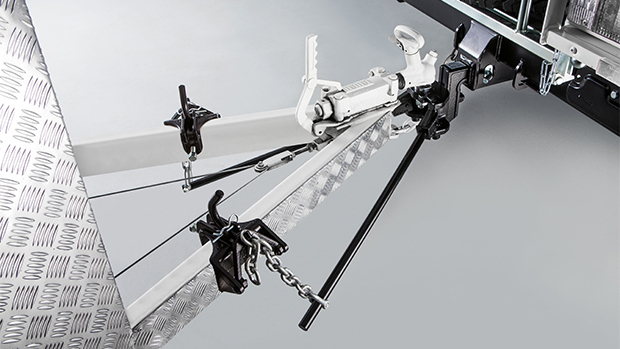 A Weight Distribution Hitch (WDH) spreads your tow ball weight evenly across your chassis (both vehicle and caravan) whilst raising your vehicle rear end and correctly positioning your rear axle. This will improve braking and steering performance by providing a constant downward force over the front axle of your vehicle. Airbag Suspension will ONLY level up or raise your rear end axle to the correct position. This will make your setup look level but it will NOT distribute your tow ball weight evenly or correctly, therefore it will NOT improve your braking and steering efficiency as effectively as a Weight Distribution Hitch as there will NOT be a constant downward force over the front axle. Generally speaking when towing, airbags are NOT an effective solution to levelling up a vehicle that is sagging in the rear (compared to a WDH). Airbags are generally used to level up your vehicle when it is loaded over the rear axle and you are NOT towing anything. This will improve vehicle balance and overall brake and steering in this load carrying application but may lead you to a false sense of security in a towing application. Check the condition of your tyres, look for excessive or uneven wear, cracks, bubbles or even foreign objects embedded into your tyres. Anything that can compromise the integrity of the tyre should be rectified ASAP. Make sure your tyres are correctly inflated to manufactures specifications. There are recommended tyre pressures for normal operating and max load conditions. Towing mirrors are great for that extended view which can eliminate blind spots and give you a better view of your whole vehicle setup. If you don’t want permanent extended mirrors on your car there are lots of different ‘Easy fit’ designs that allow you to fit your mirrors temporarily with no tools required. Your tow ball coupling is adjustable, so make sure ball and coupling are a snug fit to eliminate the possibility of the coupling slipping off the ball. Over adjusting can also make it hard to detach, so find the right balance. You can feel the excessive play in your coupling through your vehicle if it is not adjusted properly, especially on take-off you might feel a slight jarring if the ball has too much room inside the coupling. Make sure your safety chains are attached and serviceable, correctly rated chains and ‘D’ shackles are mandatory. Your electrical cable running your electric brakes and lights are imperative for a safe journey, you can buy an adapter to suit every type of plug configuration imaginable these days. #9 Book your vehicle into your nearest Caravan Repair Centre for a complete check over. Like a road worthy on a car, you can also have your caravan professionally looked over and serviced for peace of mind before that big trip. Friendly advice on vehicle setup and capabilities are an inexpensive way to minimise the possibilities of potential ‘accidents’. The number 1 cause of accidents involving caravans is incorrect vehicle setup. An incorrect setup can end up in disaster that even the most experienced of caravanners cannot avoid. #10 INSURANCE! INSURANCE! Go get INSURANCE! When your home away from home is in need of repair, a good insurance policy is worth its weight in gold…..and it’s a lot cheaper compared to normal car insurance. Most annual policies are literally less than the cost of a couple of tanks of fuel, you will be surprised! Read the fine print! Full comprehensive insurance does not necessarily mean full comprehensive insurance! There is a difference between full comprehensive ‘accident’ cover and full comprehensive ‘accident and manufacturing fault’ cover – make sure you have both or at the very least ‘water damage cover’, you would be surprised at the amount of caravans that leak from new due to manufacturing faults which can lead to internal wood rot and cost thousands to repair.